How did you became a goldsmith? I was student at the Architecture Faculty and was very attracted by forms and materials of every kind ... and I found jewels were very fascinating. This interest grew up with time and - well: I decided to go to a goldsmith's workshop instead of going to university! In that workshop I learned how to make jewels. It was very hard a first: there were always lots of new things to learn, and many occasions for doing somewhat wrong, too ... 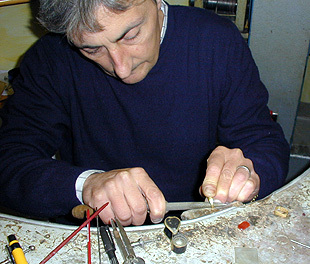 But I really liked to be a goldsmith, and I kept on learning ... After three years I opened my own workshop. What do you like most in your job? Which jewels do you like most to create? The bewildering variety of techniques and working methods: this is what I like first of all. You can create every object you can think of. There are so many techniques: some are more easy, some are really time consuming: take the Florentine fretwork, for example. First you have to curve the gold plate, and mark all the forms to be drilled on it; then you must cut away gold with a hacksaw. Very slowly, very carefully. A very long time and great attention are required for doing this ... But hey, what a satisfaction when you see the ring is taking its shape, and it's exactely how you imagined it! Objects I like most to create? Rings and earrings; bracelets too. In the window are also some lockets. Yes, it is an idea I had by chance when a friend of mine, Francesco de Masi, showed me some photographs of Florence he had done. They looked like paintings, miniatures ... I was impressed how beautiful they were, and thought: ��It would be great to make medails with those views of Florence ... 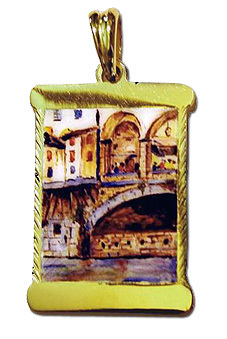 Yes: enamelled lockets!�� It is a very ancient technique: figures are made with coloured powder on a golden plate, then the powder is melted in a special oven. Here, look at these colours: how bright they are! What is the most particular thing in these lockets? They are unique pieces: they are completely hand-made, it would be impossible to make an exact replica. Colour shades, border chiseling ... everything is unique. What is this LeBottegheDiSantoSpirito Association? It is an Association of shopkeepers and artisans of and around Santo Spirito Square. Its aim is to keep alive the Square, and the neighbourhood too: in the forthcoming months we will organize festivals and other events in the Square. Everybody can partecipate: inhabitants, tourists, shopkeepers, adults and children. In Oltrarno and in the quarter of Santo Spirito you can still find a way of life that has gone lost in other parts of the city - we want to be a part of this life, not only work here! Your advice for a young man or woman who would like to become a goldsmith? The first step is going to a good school: is very important to learn the basic techniques, history and culture of jewels ... and to have much, much patience: one learns day after day, one learns also from own errors. Do not lose heart when you make something wrong: I made many errors at the very beginning - I hated it, but it helped me in finding my way. What do you foresee for the future of Florentine goldsmithery? A friend of mine - a goldsmith - lives in the United States since many years; he came back to Florence after 12 years, and was surprised to find here jewels like those he was used to see in New York or Los Angeles. On one side there is this trend to "globalization" of forms and motives, the production of jewels following current fashion; on the other side in Florence you can still find many, many workshops - even small, like this! 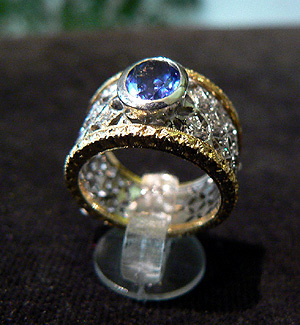 - carrying on the artisan tradition of unique-piece jewels, often made following the customer's design. Well, I think these trends will continue also in the future: they are two different things which do not exclude each other.